When I'm looking for cool small-press comics one place I often succeed in finding neat stuff is Etsy. 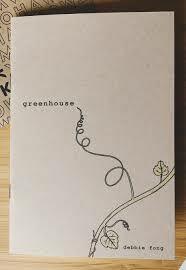 I've discussed some comics I found and bought on Etsy before, and this latest one, "Greenhouse," is quite a find. Written and illustrated by Debbie Fong, it was funded via Kickstarter and after backers were given their copies Ms. Fong sold additional ones on her Etsy store as well as via her own merchandise website, POMMO Press. The comic follows the story of an unnamed young woman who has essentially shut herself off from the outside world. Able to do all kinds of freelance work from home and have anything she needs delivered to her apartment in the city, she stays put in her home full of plants. Over time it becomes apparent the woman herself may be going through a strange physical change, but this isn't presented in a scary way as she's cool with it. As the woman's house gets progressively hotter, wetter, and basically like a Greenhouse, us readers witness the weirdness. 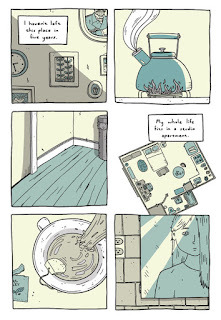 Fong's illustrations are great in the comic, with everything from spilled coffee to other debris taking upon a tree or plant-like appearance as the nameless woman's small world morphs along with her body. An apartment that at first just looks full of plants turns into an absolute jungle and Fong cleverly breaks-up the mini-chapters with faux-excerpts from a book on plants, providing information on various leafy beings. 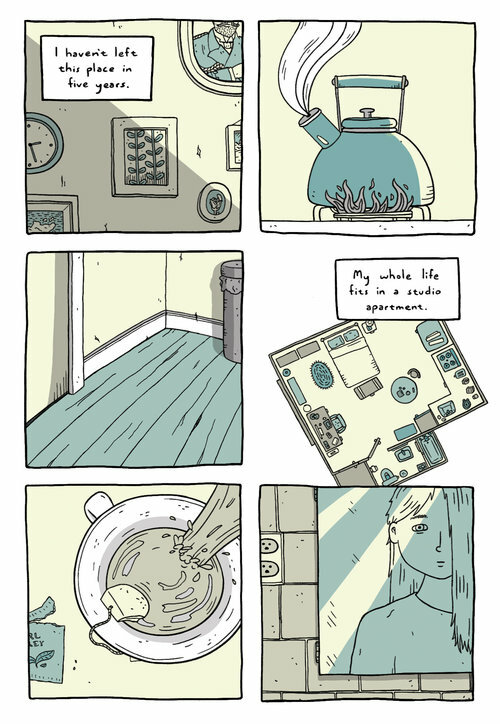 "Greenhouse," is a great comic that I'm overjoyed to have found in my online browsing. Its mixture of banal reality and otherworldly fantasy works spectacularly over the span of its brisk read. Fong's great artwork and the surreal imagery it provides result in a great comic I'd recommend people check out either through getting it at Fong's Etsy store, or through the POMMO Press website. I rate this a fantastic 5 out of 5 stars.